The Nun is from the Conjuring franchise, making it the fifth movie they have made. This movie takes place before the Conjuring and Annabelle, which are previous movies from this franchise. The movie starts off with Sister Irene who has yet to take her vows to be an official nun and Father Burke. They were called in by the Vatican to investigate a nun who jumped off her balcony in Romania, killing herself. The two then are asked to spend the night in the abbey, which they find out has an evil presence living there. They then have to find a way to get it out. The actors in the movie were mediocre, but not bad. They acted it out as best they could, but more emotion would have given the realistic effect of being scared. The special effects in the movie were done thoroughly: there were no harsh edges and the nose looked real on the nun. Makeup and wardrobe were very well done all together. The makeup looked realistic and not cartoony. The scenery was nicely put together as well; it was enjoyable to look at and it pulled the whole Romanian theme together. The absolute worst part about the whole movie was the classic, and corny jump scares everyone knew was coming. 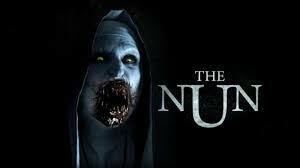 Certain scenes in the movie would start off with some scary music, and as the viewer would automatically know when the music stopped, ‘surprise’, the nun was there. If the producers would have taken a more original route to make it more of a thrill for the watchers, it would keep them on the edge of their seats waiting for the next scare. But, sadly they did not do this. In conclusion, The Nun is not a must-see movie. This is only the type of movie to see if there is nothing else to watch. There was a lot of potential for this movie, but it fell short due to under dramatic jump scares and lack of original content.